The poems in this book are intended to perhaps trigger the possibility of living the lives we dream. Life is a journey during which we human beings have the unique ability to explore our inner-most feelings and thoughts. Imagine if we achieve this dream what new imaginations are possible. Imagine that we could live the lives we dream. In today’s reality, what goes up does not necessarily come down. We can explore the idea of a fearless state of being; we can examine a state of mind that does not recognize boundaries or limitations; and we can live the life we dream. 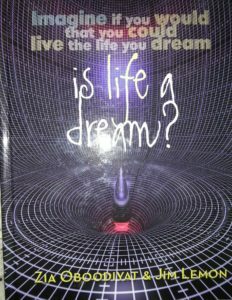 So is life a dream or could we actually live the life we dream? Could we live in a world where there is no child left behind, no one goes to bed hungry and we all live in peace and harmony?